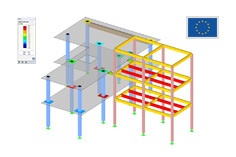 When entering the cross section, the add-on module CONCRETE shows me: "Error 32: The cross section type is not supported by the CONCRETE rods, so no design for this cross section follows. " If a new cross-section is created in RSTAB / RFEM, then you will find various cross-section types in the "Parametric - Massive" category. If the mouse cursor stops there for a moment over a button, you will receive information about the additional modules in which this cross section can be dimensioned (see Figure 1). The cross-sections marked green in Fig. 1 can be dimensioned in CONCRETE (RSTAB) or RF-CONCRETE Members (RFEM). 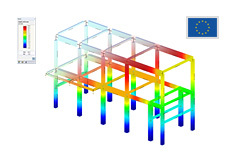 A pi-section type A, for example, can not be dimensioned in CONCRETE or RF-CONCRETE bars. However, as shown in the info, it is possible to size this cross-section in RF-TENDON. 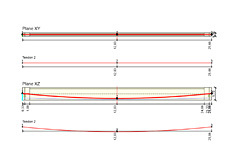 You can therefore select this cross-section for a rod in RFEM and dimension it in the add-on module RF-TENDON Design. Why can not all cross-sections in CONCRETE or RF-CONCRETE Members be dimensioned? 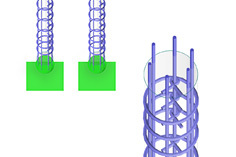 This is due to the available reinforcement layers for the individual cross-section types. If you create a rectangular cross-section and use it for the design in CONCRETE, you will find the reinforcement layer or the reinforcement distribution in the mask 1.6 in CONCRETE (see Figure 2). For a rectangular cross-section, you can choose between different reinforcement distributions and, according to the selection, will receive different possible reinforcement layers. These reinforcement layers are required to determine the stresses and strains in the cross section and ultimately the required reinforcement. For the other cross sections z. B. Pi cross sections, this information is not available in the current state of development. 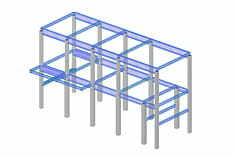 Therefore, these sections can not be dimensioned in CONCRETE (RSTAB) and RF-CONCRETE Members (RFEM). With the add-on module DICKQ one could, among other things, create the static system (with pi-section) in RSTAB / RFEM and determine the relevant internal forces. Then you could create in the program DICKQ the appropriate import the internal forces from RSTAB / RFEM and prove the cross-section there under manual specification of the longitudinal reinforcement. In DICKQ you are basically free about the cross-sectional geometry.